Our design classic, the UNO 24 from 2008, now in a completely newly developed titanium housing. A total weight of only 39 g makes it extremely light and comfortable to wear. No matter from which side you look at the new UNO 24, its concise housing design convinces from every angle: architecture for the wrist. A detailed explanation of the 24-hour one-hand principle and a graphic explanation of how to read a 24-hour watch can be found via the link above. When developing our 40 mm titanium case, we went to the limits of what was technically possible in order to meet the highest standards of quality, weight and design. By using anti-allergenic grade 1 titanium, the UNO 24 is one of our lightest and most modern watches. The entire watch case features an entirely functional design yet gives the impression of a sculpture that you will want to admire from every angle. All UNO-24 models are fitted with flat sapphire glass. 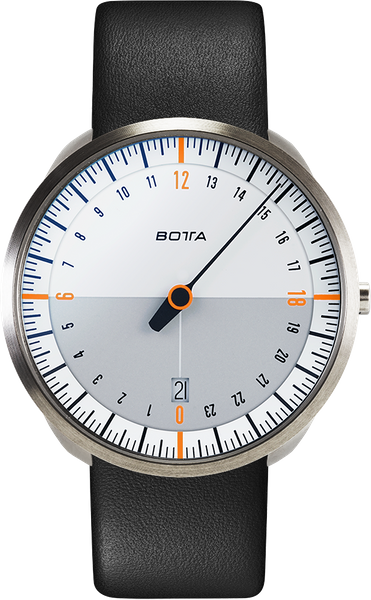 As with all Botta watches, the double-curved sapphire crystal of the UNO 24 titan has a scratch-resistant coating on both sides to reduce reflection and improve readability. This high-tech surface treatment, which is also known from high-quality optical lenses, transforms hard reflections into a transparent bluish shimmer and gives the entire watch an elegant and high grade feel. The movement: high-quality, accurate and absolutely reliable. 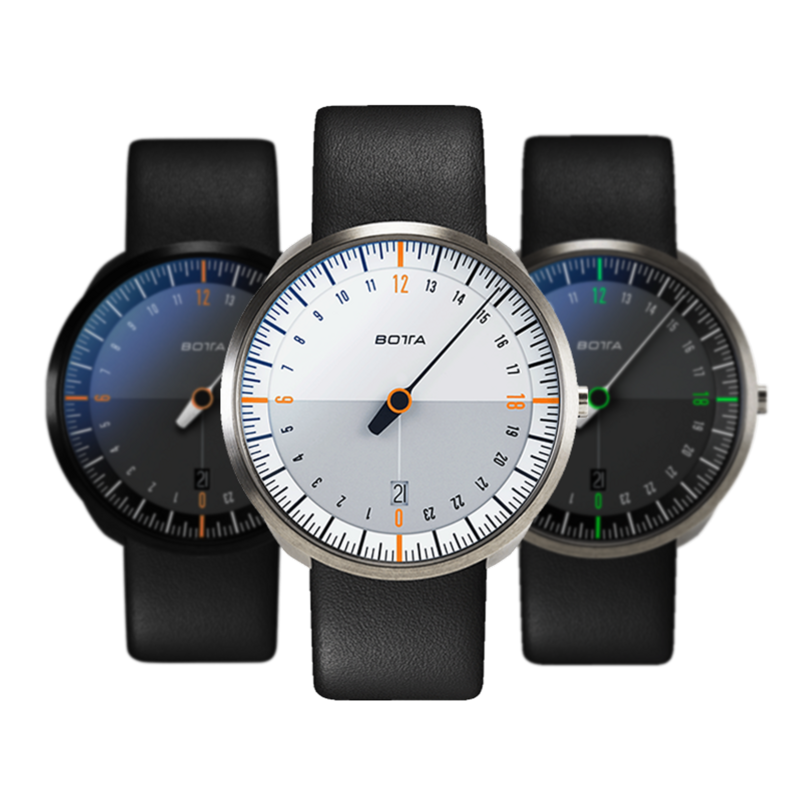 The UNO-24 models are driven by a Swiss-made Ronda quartz movement. Unlike the much cheaper “Swiss-parts” movements, the components in this movement are manufactured and assembled entirely in Switzerland. The original Ronda movement ensures that the UNO 24 will run smoothly and precisely for many years, which reflects the Botta principle of technical and design durability in its German-made watches. The UNO24 titan White/Orange Quartz will be shipped . Until then, the model can be pre-ordered at a discount of € -448. Shipment will be on a first come, first served basis.